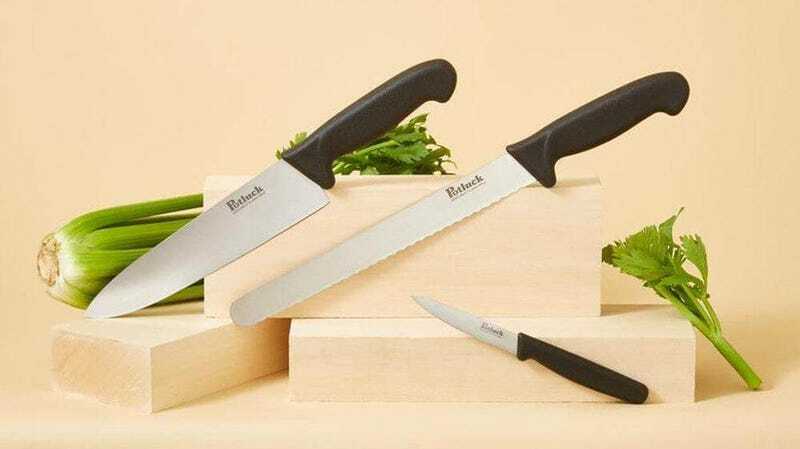 Every kitchen needs good cooking knives, but despite what door-to-door salesmen might tell you, it really only needs three of them: a chef’s knife, a paring knife, and a bread knife. Luckily, those are the only knives Potluck sells, and the complete set only costs $60. As soon as I opened my Potluck knives, I felt a sense of déjà vu The paring and chef’s knives both looked and felt almost exactly like my old Victorinox Fibroxes, the standard bearers of quality affordable cutlery, right down to the texture of the handles. A few probing emails with Potluck later, I learned that they’re actually made from the exact same grade of steel as Victorinox and Wusthof knives (X50CrMoV15, if you care to dive deeper), and are made in the same knife factory as several name brands. I’ll let you read between the lines. Upon closer examination of the chef’s knives side by side, I did find that the Victorinox blade was a few grams heavier, slightly taller near the handle, and slightly less rounded at the tip. That extra heft can come in handy, especially when cutting through bone or fibrous greens, but in my testing, they felt essentially identical to use. So why Potluck? Because you can get all three knives for $60! The equivalent Victorinox set currently costs $90, and has never gone for less than $70. And to reiterate, Victorinox knives are an amazing deal! You may ultimately graduate to heavier, fancier knives with nicer handles at some point in your life, but if you’re still using the cheap knives that you bought in college and have been throwing in the dishwasher for years, you’ll be amazed at how good Potluck’s feel to use.